The one struggle of being a woman who reads is that you want to read everything. It's easy to get overwhelmed by bestseller lists, because there just isn't enough time in the day to read every hot new book. Between near-constant recommendations of amazing memoirs, new sequels and a terrifyingly long list of bookmarked Internet longreads, it can be stressful to choose what you should pick up next. Knowing which classics you're missing from your reading repertoire is easy -- it's a little harder to remember what you've missed from three years ago. We've done a little bit of the hard work for you (or maybe just increased your book stress... sorry) by pulling together a list of incredible titles from the past few years that you should add to the pile on your bedside table. These books by women are just a few of the incredible titles published recently -- an exhaustive list would be hundreds of books longer. 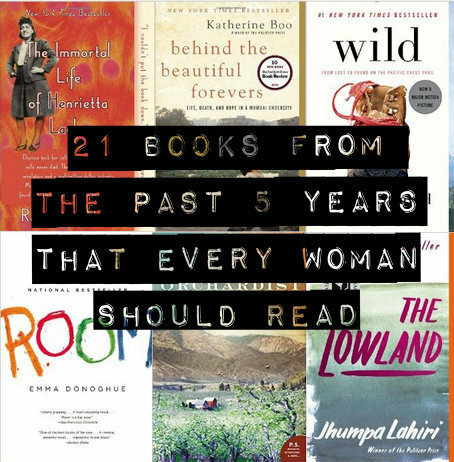 Those listed here are some of the most-discussed, thought-provoking and life-changing books from a diverse group of women writers. They make you rethink what being a feminist means, offer life advice to women of all ages, and reinforce your long-held belief that Tina and Amy should be your best friends and life coaches forever. The novels are some of the finest writing from woman authors. From lighthearted memoirs to harrowing thrillers, there's a genre here for everyone. What would you add to our list? Comment below, or tweet @HuffPostWomen!